We’re asking you to take a leap of faith and regard these deep-fried chicken wings as easy entertaining. Allow us to explain. We know that in the minds of many, the very notion of easy entertaining clashes with anything that requires deep-frying in small batches while guests are in the house. And we understand that. Yet if your house is one in which people are drawn to the kitchen, think about it. You get to bask in the pleasure of their company while you cook rather than being isolated as you stand at the stove, your guests will undoubtedly be impressed with your culinary prowess, and everyone can take part in one of those Hallmark moments standing around and snitching wings straight from the oil-splotched brown paper bag while sipping something strong. Seems to us like it works out pretty darn stunningly well for everyone. 1. Heat enough oil to reach at least 2 inches deep in a large, deep-sided pot until it registers 350°F (177°C) on an instant-read thermometer. 2. Cut off the pointy tips from each chicken wing and discard or reserve for chicken stock. Pat the wings completely dry with paper towels. 3. Add about 1/4 of the chicken wings to the oil and cook for 6 to 7 minutes, until cooked through, crisp, and golden. 4. Meanwhile, place the garlic cloves on a cutting board and, using the flat side of a large chef’s knife, smash them and remove the papery skins. Sprinkle with some salt and use the side of a large knife to mash the garlic into a smooth paste. Put the extra-virgin olive oil and the garlic in a small pan, and place it over medium-low heat. As soon as the garlic begins to sizzle, add the red pepper flakes and cook very gently for about 2 minutes, until the garlic is very lightly golden. Stir in the paprika and sherry vinegar and remove from the heat. 5. As soon as the first batch of chicken wings is cooked, drain them briefly on brown paper bags and then transfer them to a serving bowl or platter. Drizzle with some of the warm garlic dressing, toss well, sprinkle with a little sea salt, and start snitching some while you repeat with the remaining wings. If you’re deathly afraid of hot oil (don’t worry, we won’t tell) or simply don’t care to stand at the stove and fry batch after batch of chicken wings, we’ve got you covered with this baked variation. Instead of heating the oil, preheat the oven to 450°F (235°C). 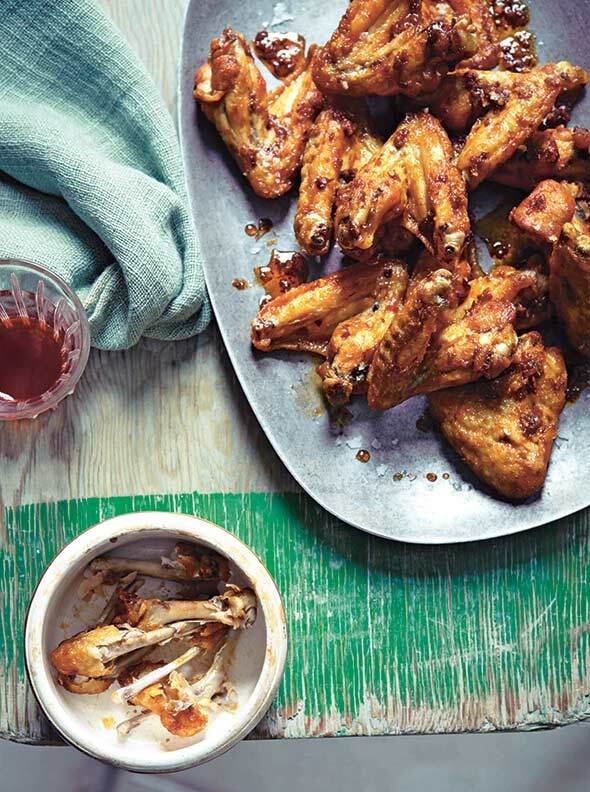 Lightly coat the chicken wings with olive oil and place the whole batch on a baking sheet lined with parchment paper. Bake until the wings are cooked through, crisp, and golden, about 30 minutes. Meanwhile, celebrate that your oven’s doing the work for you and make the warm garlic dressing. Drizzle it on the chicken, toss well, sprinkle with a little sea salt, and serve. These deep-fried chicken wings were moist, with spark and pucker from the sherry vinegar and sweet paprika, and there was enough heat from the red pepper flakes to make the dish even livelier. Warmth and richness from the garlic paste sautéed in olive oil complemented the acidity, and an addition of chopped fresh cilantro just before serving, with its clean, green accent, resulted in a perfect outcome. I was ecstatic. Rather than merely enjoying as an appetizer, we turned the wings into a meal with fresh corn on the cob and a crisp Taj lager. I intended to follow with a salad, but we were so supremely satisfied that it wasn't necessary. This is not the way I usually make wings, but these deep-fried chicken wings were just short of really excellent. With a couple of minor adjustments, they would be perfect. I was having guests for dinner and planning on serving wings in addition to BBQ beef as part of my main course. When I opened my package of wings, to my surprise, there were exactly 24 wings! I used a 12-inch frying pan and canola oil, and I was able to fit 1/2 the wings at a time. After 7 minutes on medium-high heat, the wings were neither crisp nor golden yet. After 10 minutes, they were still not super crisp or golden, but I was afraid of overcooking them, so I removed them to drain on paper towels. I only had smoked paprika available, so I used that for the garlic sauce. This recipe was easy to make, and the wings were very well-received by my guests. We all would've liked the sauce to be a little hotter and more garlicky. My hands-on time was about 1 hour, but that was because I spent 25 minutes prepping the wings. I'm kinda fanatic about pinfeathers, and I always spend an inordinate amount of time making sure my chicken wings are totally pin-free. If not for that, the total time would've been 30 minutes (including 5 to 6 minutes for the oil to heat and 10 minutes for each batch of wings to cook). This is a recipe that I will definitely make again and again. Simple and yummy. From the moment I saw this recipe, I knew I had to make the baked variation. The results were fantastic. I always bake my chicken wings as opposed to frying. I had 12 chicken wings and rubbed them slightly with a very light coating of olive oil and placed them onto a parchment-lined baking sheet with at least a few inches of space between each wing and baked them in a 450°F oven with convection fan to further dry out and crisp the skin. Within 30 minutes, the internal temp was 165°F, and the skin was light golden brown on the top and brown on the bottom. I was going to flip the wings halfway through, but they were already done cooking by the time I got around to it. I was extremely happy with the results. Baking and high temp has always worked well for me. Even when making classic Buffalo wings with butter and Frank's RedHot sauce, I usually bake them with just a light coating of oil and dunk them in sauce when they're done. I also cut about 8 carrots on the diagonal into 2-inch segments and parboiled them for about 10 minutes. I then placed the carrots on a separate sheet pan and lightly tossed them with olive oil and baked them for about 20 minutes while the wings were baking. I plated the wings and the carrots together and drizzled the full amount of garlic sauce over the wings and carrots. It was enjoyed by all, and I would definitely make this recipe again. It was a quick and easy weeknight supper with some baked potatoes to go alongside. 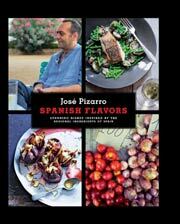 Spanish-Style Deep-Fried Chicken Wings Recipe © 2012 José Pizarro. Photo © 2012 Emma Lee. All rights reserved. All recipes and photos used with permission of the publisher. These sound amazing! Love wings. Love garlic. Love sherry vinegar. I do believe this recipe was made for me. Lovely to hear from you, ruthie. And what can I say? I was drawn to the recipe, same as you. Would love to hear what you think of these wings. And oh yes, the tips are so perfect for stock, are they not?